When Sarah Robarge was 15 years old, a horse ride changed her life. That fateful day, her horse became startled and reared up, throwing her from the saddle and onto the ground before the animal fell on top of her. The accident resulted in two back fractures in and a hip injury. On and off for the next 15 years, Robarge had to wear a back brace and tried everything from medication to surgery to massage therapy, but still suffered debilitating pain. That is, until, she discovered Rolfing, a unique kind of massage therapy aimed at realigning the body to minimize pain and tension. Ida Rolf, a biochemist, created Rolfing in the 1930s. After completing a series of Rolfing therapy with Wells Christie in Syracuse, Robarge’s pain was gone. Robarge completed a Ten-Series, which typically spreads one-hour sessions once a week over 10 weeks, but could be extended to progress once a month over 10 months. The first three sessions are known as superficial sessions, working the superficial layers of the fascia, also known as connective tissue. “It just changed my life so much that it inspired me to do that, so I could help people the way that I was helped,” Robarge said. According to the Affordable Care Act section 2706 titled “Non-Discrimination in Healthcare,” insurance issuers “shall not discriminate with respect to participation under the plan or coverage against any health care provider’s license or certification under applicable State law.” Because Robarge’s practice is licensed, Rolfing would be covered by insurance, dependent on the individuals insurance provider. Robarge now practices as a certified Rolfer, but getting to this point was not easy. 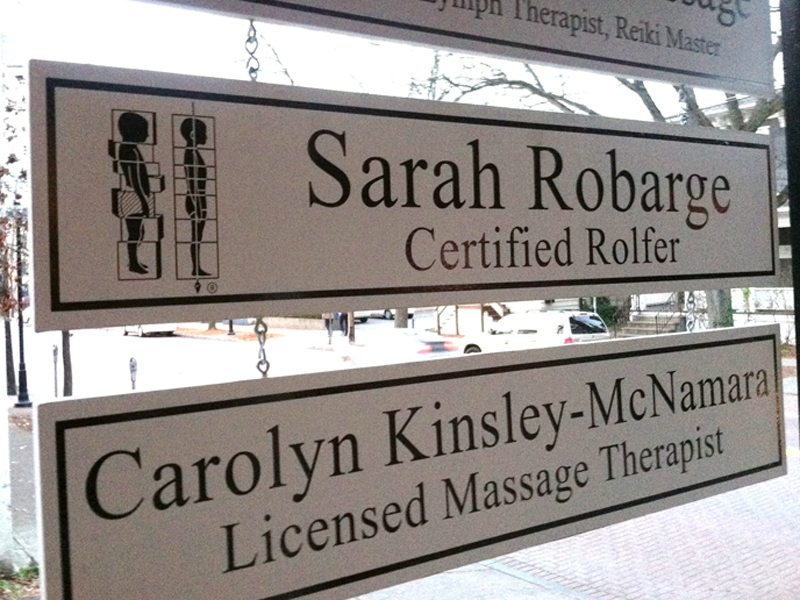 New York state requires Rolfers to be licensed as massage therapists first, and the only Rolf Institute currently in the United States operates their instruction in Colorado. Robarge spent the first semester studying in Colorado, and then travelled to other parts of the world where the practice is more widely practiced. She lived in Malaysia for the second semester, and studied for the third semester in Bali and Indonesia. Rolfing is more thorough than traditional massage therapy and based on discovering the source of tension-related problems, Robarge said. Unlike the temporary relief and relaxing chemicals released in a typical massage, Rolfing aims to realign the body to help the pain dissipate all together. Susan Winter, the Manager of Marketing at the Rolf Institute, said the practice used to be more intensive and painful. The founder, Ida Rolf, initially would patients lay on the floor instead of a table. “We’ve learned over the years about the nervous system, you don’t need intensity, but intentionality,” said Winter, a patient of Rolfing herself. If either the patient or the Rolfer senses too much pain, attention can be placed on shallower layers of connective tissue. Robarge’s practice, located at 409 W State Street, will have been established a year in January. Marty Johnson greets his friend and fellow alliance founder Annie Quach in his store, Uncle Marty’s Shipping Office, and soon they begin talking about the designs for the logo of their newly formed group: the Collegetown Small Business Alliance (CSBA). The Alliance was founded this summer between Johnson, Quach — who is the general manager for Hai Hong a local Chinese restaurant — and Natalie Sweeney, owner of Natalia’s Boutique with the purpose of promoting more business in Collegetown. Johnson says the three are good friends and wanted to form the alliance to help each other’s small businesses. Unlike the Downtown Ithaca Alliance, which has about 100 shops and serves over 50,000 residents, the CSBA is still in its early stages and has not expanded outside of its three founding members. The DIA has been a part of Downtown Ithaca since 1997, and has helped small businesses in the area thrive through special events such as Apple Fest and Chili Fest. A map of Collegetown, alliance businesses, and parking. The new group’s goal is to create events in Collegetown to promote more business in the area, through street fairs and greeting college students during orientation to show them what Collegetown has to offer, says Johnson. These future events are meant to help all businesses, whether they are part of the alliance or not, he adds. Johnson says that the trio has reached out to other local businesses, such as Big Red Barber Shop, Proper Puss, Stella’s Rulloff’s Restaurant and Nail Candy. “It’s really grass-roots right now. We’re just bringing up the discussion before a formal invitation goes out, but everyone we’ve talked to are very much excited and say it can only be positive for the area,” says Johnson. Matthew Taylor, general manager for Stella’s agrees that the alliance would be beneficial to his restaurant. He says he is awaiting further news about the CSBA. Quach, who was born and raised in Ithaca, and spent much of her childhood growing up in Collegetown says the area is declining in terms of business flow, which is why she felt there was a need for the Alliance. One of the problems many stores in Collegetown are facing is foreclosure due to the high cost of rent. Sweeney says she pays $2000 each month for her 1,010 square-foot store. Local realtor Jeff Goodmark says that the average price of retail rental in Collegetown is three times as much as other area in Ithaca, placing a strain on revenue. Johnson and the alliance have also talked briefly to Cornell University about planning events with the college for their summer program. The CSBA hopes Cornell will consider housing students closer to Collegetown during summer sessions to make it easier for them to shop there. The move could potentially create new patronage during the slow months when most students leave for summer break. Gabrielle Cramer, a Cornell student who has lived in Collegetown for the past two years thinks the alliance would be a step in the right direction for students. She says it would be nice to have more options for students to do activities over the weekends, and the alliance would help. “There are a few different bars that closed down. It’s not that Collegetown is not bumping, but its transitioning,” says Cramer, who adds that the alliance can help with this transitioning period. Johnson also publishes a blog on his company website, where further updates for the alliance’s progress can be found. As the brief meditation commenced, there was the slight creak of floorboards, the gurgle of stomachs and the hushed chorus of exhales, but it was a peaceful, powerful silence that most filled the quaint living room. Lama Pema Dragpa led the Nov. 2 gathering about the Buddhist perspective on death and dying, part of a monthly Dharma talk, a public Buddhist discussion. The meditation sessions are held in the Ithaca area by teachers from Padmasambhava Buddhist Center’s monastery retreat in Sidney Center, N.Y. Dragpa says an inclusive meeting with others to discuss and practice Buddhism is an essential part of the learning process. The monthly gatherings started two years ago, and interest has been growing locally. The Namgyal Monastery Institute in downtown Ithaca is looking into expanding their facilities to accommodate an increase in their student base, according to their website. Pema Damcho lived in Ithaca for a year before moving to study Buddhism and live at the Padma Samye Ling retreat center seven years ago. She says Ithaca’s open-mindedness and a sense of introspection has made opportunities for meditation – an essential part of Buddhist practice – available and desired. The gatherings give locals an opportunity to focus on the teachings of Buddha and discuss important aspects of the religion such as compassion, awareness and appreciation. About ten people attended the discussion on death and dying, an important thing to contemplate since it is related to how we live now, Dragpa said during the talk. “We have to really use the time now. If we haven’t trained to be peaceful and aware during our lives, why would we think that’s how we’re going to be when we die? That’s the whole point of meditation, to use our time now to connect to that absolute, undying nature in ourselves, which naturally expresses itself as love and compassion for others,” he said. The Dharma talks provide an opportunity for people to explore their own nature, something that Dragpa says all people, regardless of faith, have the potential to do through meditation and discussion. “What’s found is not a Buddhist thing or a Christian thing or a Muslim thing, you just find your nature. We all have such an amazing capacity,” he said. Ithaca locals interested in exploring Buddhism are welcome to attend the next Dharma talk in Oneonta on December 14. Scott Bronstein tasted his first wine at the age of 13 during his uncle’s wedding in Sonoma, Calif. At that moment, with his senses piqued among the gorgeous vineyards, his passion for the wine industry began. Bronstein, now 25, officially opened Barnstormer Winery in Rock Stream, NY with a ribbon-cutting ceremony on October 4. The operation has been a year in the making and first opened its doors in September. The Finger Lakes region is home to over 200 wineries, and that is a challenge Barnstormer faces. However, Bronstein hopes his organic and homegrown approach to winemaking will attract people, especially younger consumers, to his winery. Kyle Knapton, tasting room manager at Barnstormer, specifically highlights one of Barnstormer’s specialty wines: Ecstasy, a semi-sparkling sweet red blend that pairs well with desserts. A historical inspiration fused with a more youthful atmosphere is one way he says will set them apart from competitors. The 1800’s barn used to be home to the Arcadian Estate Winery. Since it closed and had a rundown appearance, Bronstein decided to give the place a much-needed facelift. Bronstein’s mother came up with the new name for the winery. Barnstormers were entertainment pilots from the early 20th century. Some were daredevilish stunt pilots, while others would sell plane rides on their flights across the county. Since their opening, around 200-250 people come in on Saturdays to partake in tastings and buy wine. This past weekend marked the busiest time for wineries in the Finger Lakes region with products from the previous harvest season ready for tasting, said Knapton. Barnstormer offers twelve wines in their tasting room; a sampling of five wines costs $3. In his blue floral-printed Hawaiian shirt and sunglasses, Eberhard Alsen happily greets two Cornell sailing students from his sailboat, a white 1986 Tanzer 25. For Alsen, sailing is a family tradition. His father once owned two yacht clubs in Berlin, which he only learned aboutThe tranquility of Cayuga Lake is a long ways from his war-marked childhood, not only in distance and time, but also perspective. Nice. Alsen was born in Nuremberg but moved several times during World War II. He studied American literature and immigrated to the U.S. in 1962 at the age of 26. Alsen’s boat, FANTASY, was named because he liked the idea of ‘imagination’ — the German translation — and how a mind could wander out on the water. It can sail at up to of 6.3 knots (about 7 miles per hour), but in late September Alsen claims he sailed at 6.7 knots. The challenge of figuring out how to maximize speed is one reason he enjoys sailing so much, Alsen said. “I still don’t know how we got it to go that fast [that time]” Alsen said. But passion like Alsen’s is fading. The popularity in the sport has seen a steady decline over the years. Since he joined the cruising fleet in 1986, the number of boats racing regularly has dropped from 50 to eight. The still struggling economy that took a turn for the worse in 2008 could be one explanation, he said. But he hopes the trend is only temporary and perhaps part of a cycle. One of the particular aspects of sailing, Alsen believes, is its unique qualities of being relaxing and exciting at the same time. This August students at Cornell University and Ithaca College founded chapters of the organization, Athlete Ally, a program dedicated to ending homophobia and transphobia in sports. Atticus DeProspo, a soccer player at Cornell, founded the chapter for the university in August. He hopes it will help foster a safe and respectful environment for all athletes, including those who are LGBT. DeProspo published a ‘coming out’ letter early last month, inspired by his professional soccer role model Robbie Rogers. In it, he explains the ‘locker room’ culture and the stigma that still exists around homosexuality in the athletic world. He told Ithaca Week his experience as a gay athlete has been a very positive and enjoyable one, but that is not the case for everyone. According to Campus Pride’s 2012 LGBTQ National College Athlete Report, which included surveys of 394 students — out of nearly 9,000 NCAA athletes surveyed — who identified as LGBQ (questioning), these athletes are two times more likely to experience harassment than their heterosexual teammates. One in four said they felt pressure to remain silent about their sexual identity among teammates, and 21 percent revealed they were targeted by derogatory comments online and through social media. Cornell athletics teams have no data for the participation of LGBT athletes in their varsity sports, but the athletics department has welcomed the new organization. Before coming out, one of the people DeProspo confided in was Brian Healey, who serves as Program Coordinator for the national Athlete Ally organization. He too shared his story during his final year as Captain of Men’s Tennis at Saint Michael’s College in Colchester, Vt.
For Healey, beginning a conversation around this issue is an important first step to creating the most inclusive environment for the LGBT community. “Intolerance…has many root causes, ignorance being one of them. That’s why work so hard to educate as many people as possible about how damaging and lasting this can be,” said Healey. The Cornell chapter of Athlete Ally is currently organizing an advocacy campaign video called “Cornell You Can Play,” as well as developing ally training in the athletic community. It meets bi-weekly Tuesdays at 8:30 p.m. in the Kaplan Room of Bartels Hall.